YONKERS, NY – June 29, 2018 – Mayor Mike Spano announced today the City of Yonkers will again designate several locations around the city as Cooling Centers during this weekend’s forecasted heat wave as temperatures may reach 90+ degrees combined with high levels of humidity. 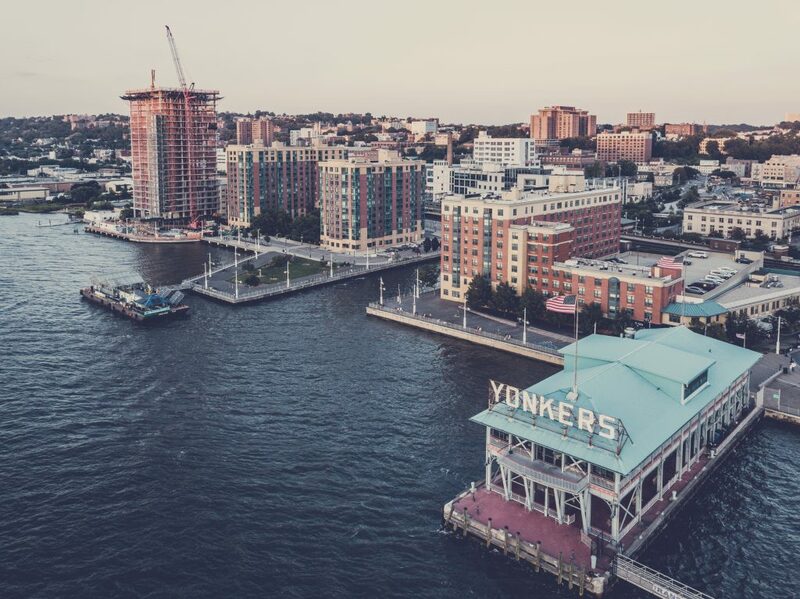 Located on the Hudson River adjacent to New York City’s northern border, Yonkers is the third-largest city in the state with nearly 200,000 residents. 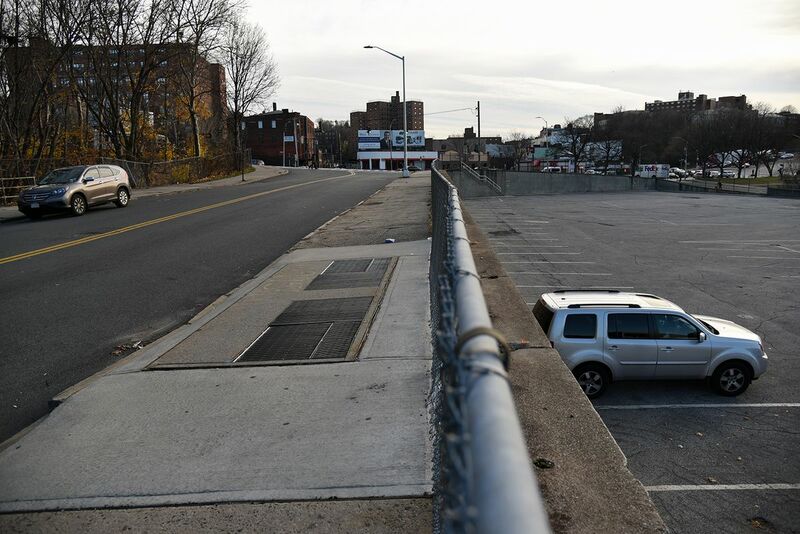 And with five major highways, two commuter train lines that are just a 28-minute trip to Grand Central, and the highest number of bus lines in Westchester County, it’s no surprise that many are going bonkers for Yonkers. Phillip Gesue, chief officer of development at Strategic Capital, the developer of the Hudson Park residential project, told 6sqft that Yonkers is in transition. 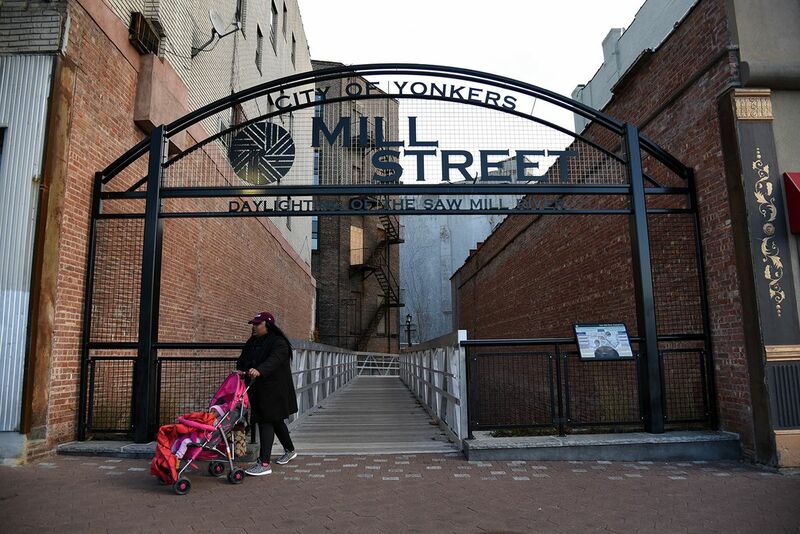 “Unlike Manhattan, which is, perhaps, over-baked, Yonkers is an affordable place to live and play,” Gesue said. “It has people who have been living here a long time and new transplants who largely want to work in New York City. 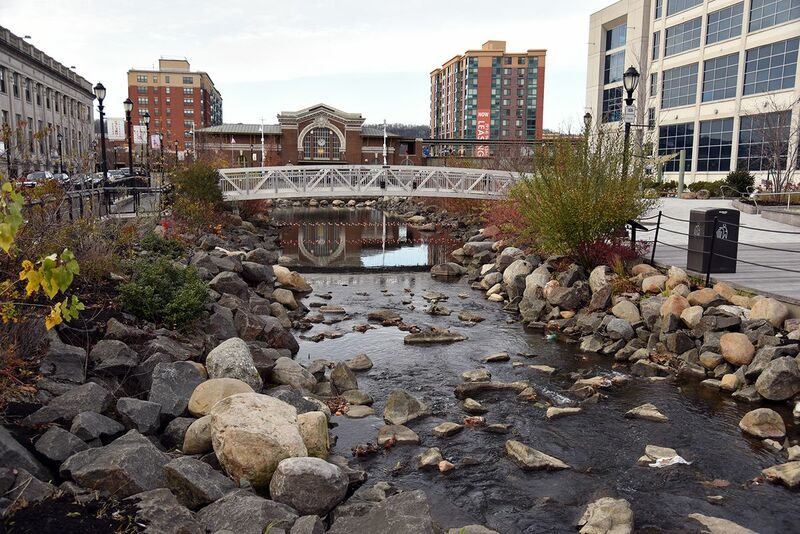 There is a growing population, development momentum and job growth.” Ahead, find out how officials are working to attract millennials, get a breakdown of all Yonkers’ new developments, and learn why there’s a lot more to do here than you might think. 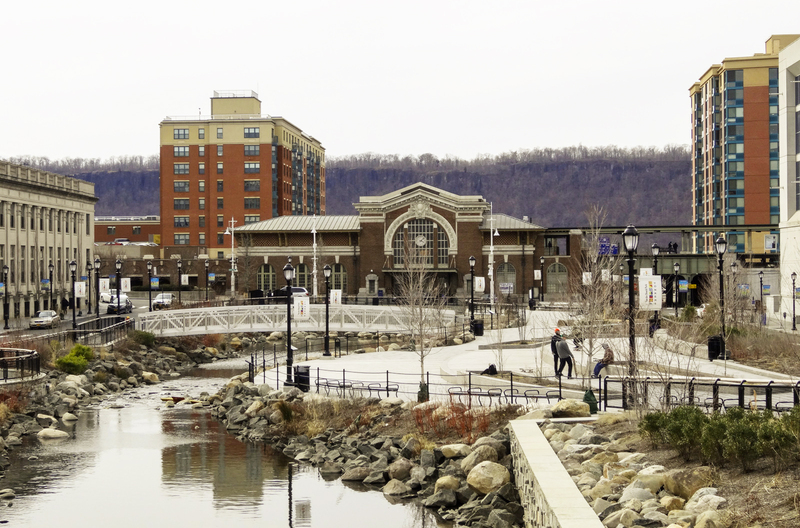 Yonkers has 4.5 miles of Hudson River waterfront. It has high- and low-rise housing, parks, marinas, fine restaurants and endless views of the Palisades. Westchester’s largest corporate park is in Yonkers, in addition to numerous retail and office locations. Yonkers also houses two major shopping malls, a central shopping corridor that runs the length of the town and the second largest casino and racetrack in the state. One of the most recent and exciting developments in the city is the massive “Daylighting” project. Daylighting is the practice of uncovering previously built-over rivers, a once common practice that many cities around the world and many cities are now reversing. Cities developed around rivers for ease of transportation of people and commerce. 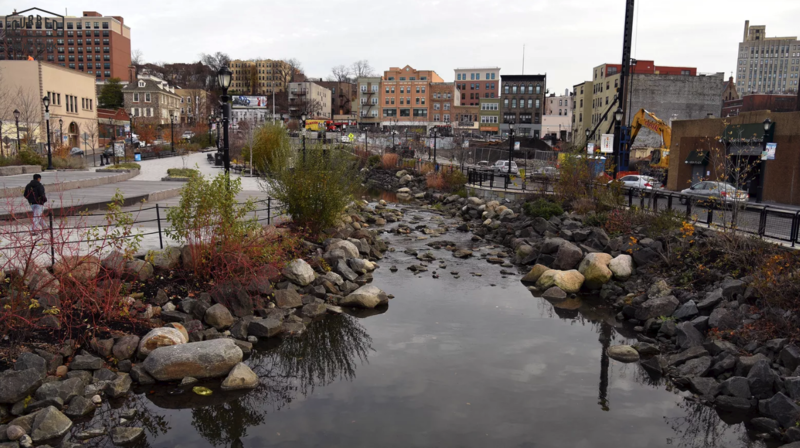 As cities grow and need for space increases, rivers and streams get built over. 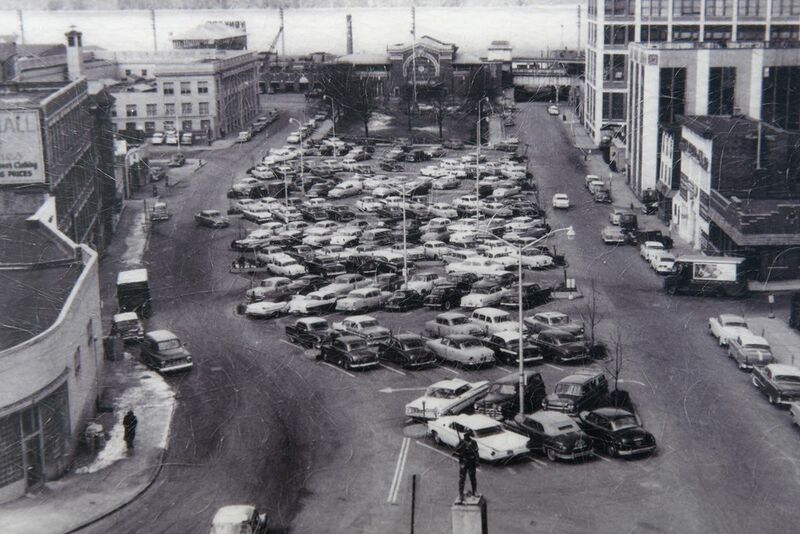 Yonkers had many surface lots built over the Saw Mill River that was buried for nearly a century under downtown Yonkers. 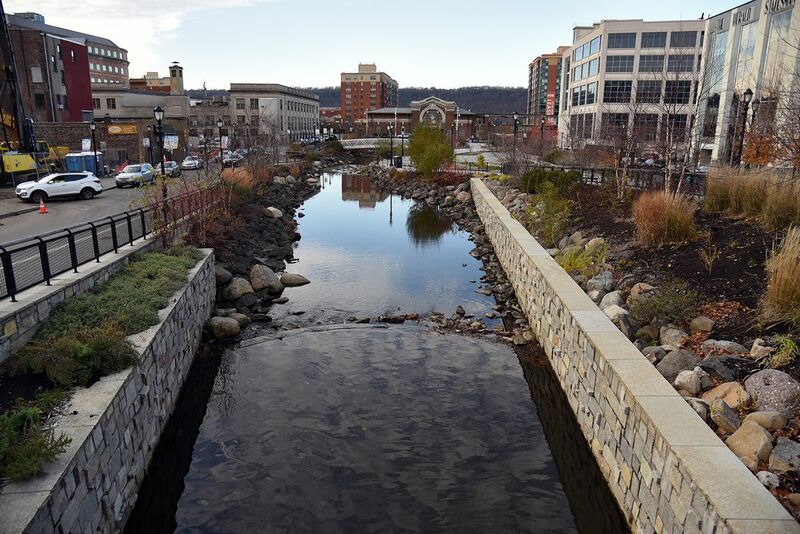 Now, thanks to a $19 million public works project nearing completion (it’s finishing phase three of a four-phase project), the Saw Mill River is now flowing through downtown with beautiful promenades alongside it. Officials estimate the project will create 950 permanent jobs within five to 10 years. And not only does uncovering this natural resource stimulates the economy, it also stimulates the creation of a natural habitat for migratory fish passage focusing on American eel, white perch, and herring that will then migrate into the open ponds. There is also an abundance of native vegetation that attracts insects and encourages food chains to sustain the aquatic life and, at the same time, maintains the water temperatures conducive to the life in the ponds. 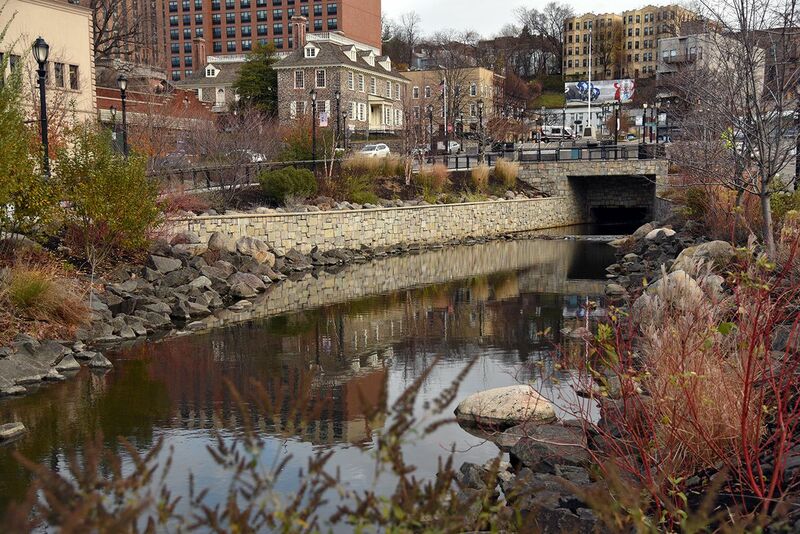 There are a lot of happy residents, visitors and aquatic life in Yonkers. After recovering from the 2008 recession, there has been a flurry of building activity as Manhattan real estate heated up and Yonkers benefitted from people, mostly millennials and empty nesters, looking for better values. Many regional and national developers have also headed to Yonkers and are building luxury residences packed with amenities to make the 28-minute commute to Midtown seem inconsequential. Wilson Kimball, the Commissioner of Planning and Economic Development, says Yonkers recent successes are all thanks to Mayor Mike Spano. In addition to his greenlighting the highly successful Generation Yonkers media campaign, his “concierge service” for development has been very well received. Kimball says, “We don’t mind meeting with people on the front end to save on the back end. We will schedule for all the city officials to meet with developers, architects and engineers to streamline the process.” Kimball explains that rather than wait for issues to arise in the building process, city officials meet with the development teams, figure out what may be an issue and circumvent the problem by planning ahead. Yonkers is actively targeting the millennial and empty nester populations from Manhattan and the surrounding area. Their dedicated efforts are paying off. 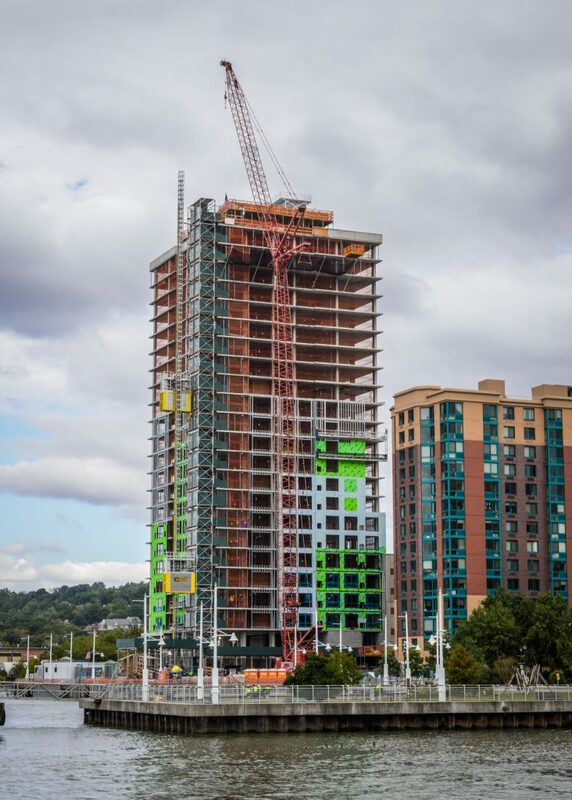 Hudson Park is a massive 16-acre development along the waterfront of Downtown Yonkers, which already has three existing buildings currently being updated and renovated by Strategic Capital, as well as a new fourth tower. 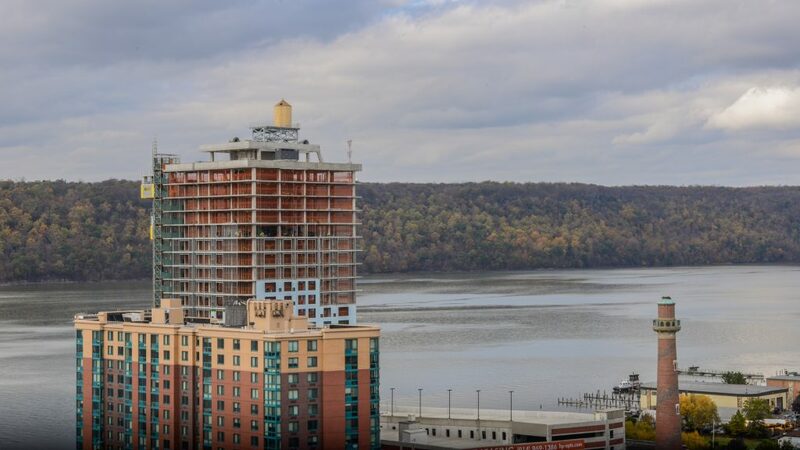 Located in a resort-like setting, the apartments at Hudson Park boast spectacular views of New Jersey’s Palisades and the Hudson River. 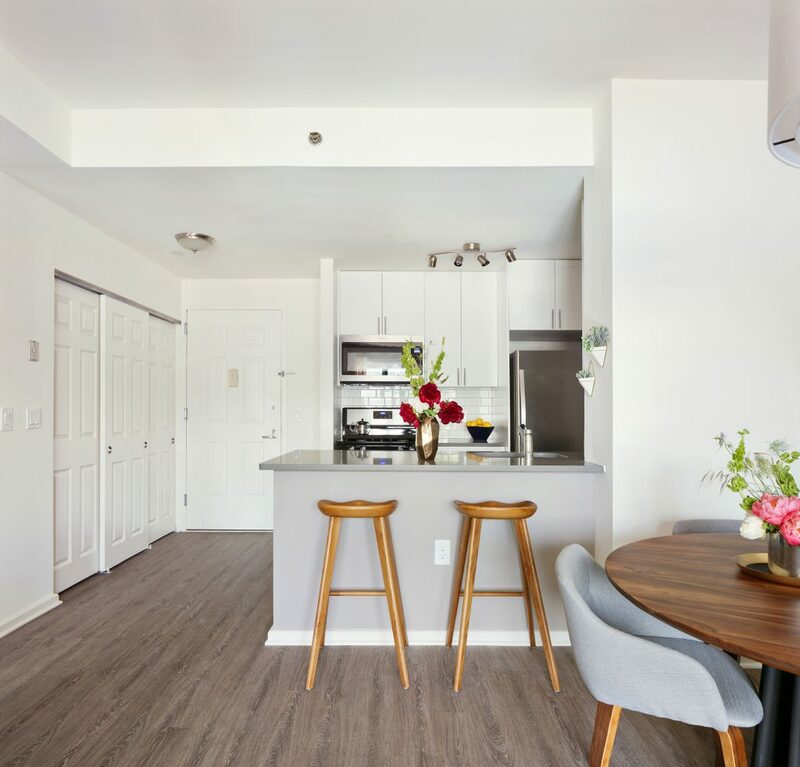 The apartments include energy-efficient, stainless steel appliances, nine to 10-foot ceilings, wood-style flooring and tiled kitchen and bath, ensuite washer/dryer and walk-in closets and naturally lighted baths. Because of the scale of the development, there are a huge amount of amenities which include, multiple fitness centers, yoga and aerobics classrooms, an anaerobic workout room for spin, a conference facility, a co-working space, a resident lounge, a resident dining area, a rooftop lounge, an indoor lap pool with a 22-foot ceiling and floor-to-ceiling windows overlooking the Palisades, onsite retail, a concierge service, fully staffed buildings. 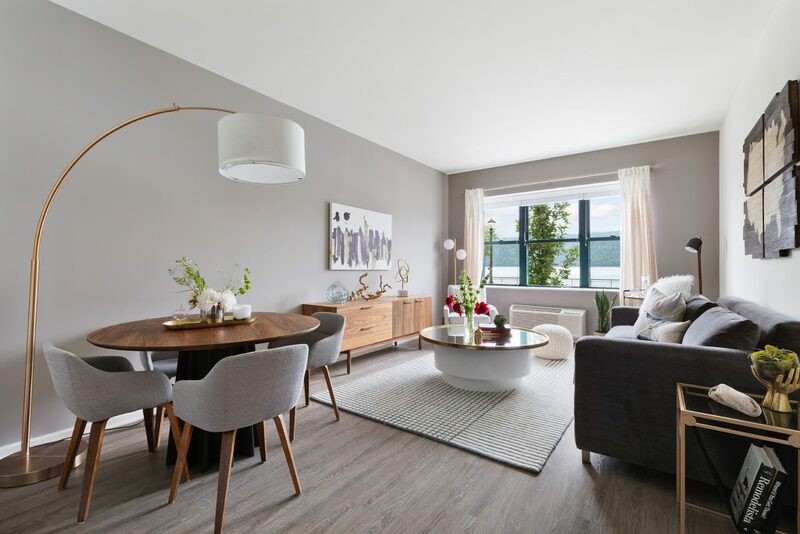 Situated one block away from the Metro North, and directly across from the recently daylighted Saw Mill River, the RXR Realty four-building development includes a 25-story building, a 17-story building and two smaller two and three-story buildings. 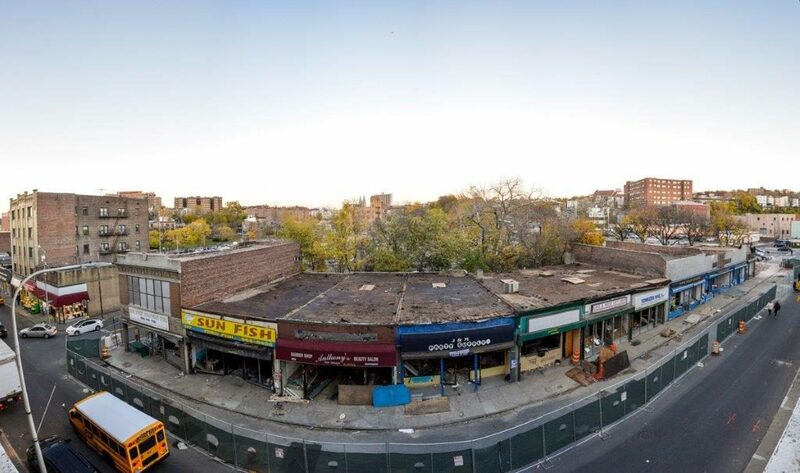 The Larkin Plaza development has a whopping 442 new residential units with 35,000 square feet of new restaurants and shops just a block from the City’s train station and fronting the newly-created Van Der Donck Park. Many of the apartments have views of the park, the Hudson River and the Palisades. The buildings include a landscaped roof terrace with outdoor seating, an attended lobby and concierge services, a resident lounge with media center and billiards, a resident business center with Wi-Fi, on-site restaurants and retail along the park and on Main Street, and attached and covered attended parking garage with a private resident entrance. Modera is a 24-story luxury apartment building offering studio to three bedrooms, with an average size of 950 square feet. Set on a 3.7-acre property, the building’s modern design and amenities integrate with the riverfront landscape. Modera Hudson Riverfront strives to balance relaxation and convenience. Building amenities include a clubroom, outdoor courtyard, sky lounge with a golf simulator, an outdoor pool. 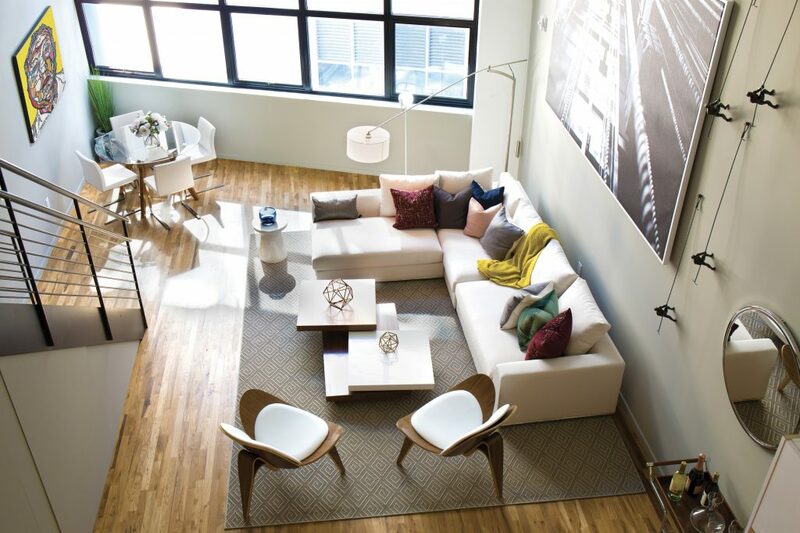 66 Main boasts spacious studio to two bedrooms with state-of-the-art kitchens and floor-to-ceiling windows to take in the spectacular Hudson River, New Jersey Palisades, and Manhattan views. Apartments have features like hardwood floors, washers and dryers, and walk-in closets. The building amenities include a basketball court, a rooftop club room and outdoor terraces, a media room with a 60” plasma TV, 24-hour security and concierge and in-building covered garage parking. UNO is a conversion of the classic Otis Elevator Building into a combination of 50 Statesman Lofts and 50 Micro Flats. These Soho-esque industrial chic residences have 16-foot ceilings, oversized windows and cutting-edge apartment technology. Amenities include a rooftop deck, an outdoor patio, a community room and a co-working space. There is also free high-speed WiFi in every apartment, space-saving Murphy beds, a community room and bike storage. 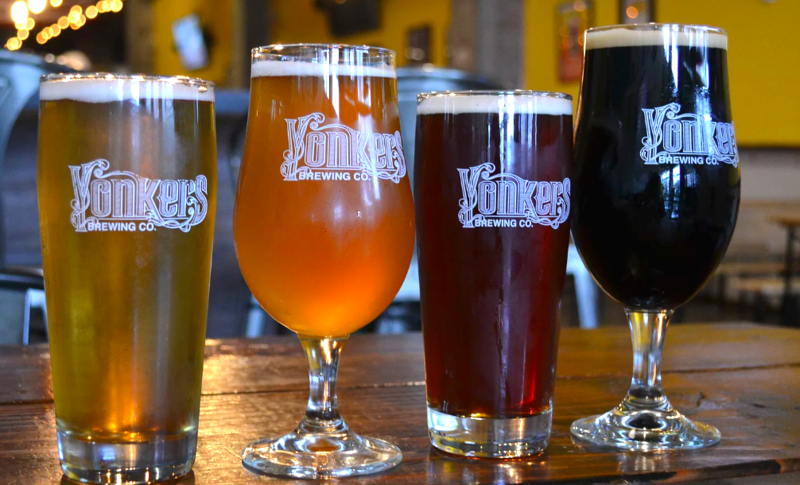 Yonkers Brewing Co. is the creation of two Yonkers’ natives John Rubbo and Nick Califano who really love beer. Located in downtown Yonkers, Rubbo and Califano wanted the brewery environment and culture to reflect how they see their hometown and be a place where the community can come together and enjoy a lively environment. 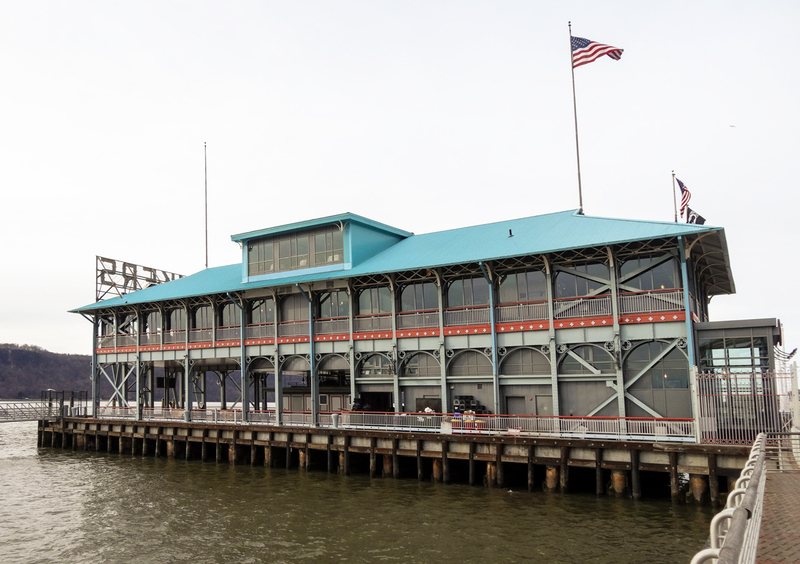 A stunning, glass-enclosed restaurant on a pier has globally influenced American fare with stunning Hudson river views. The menu at X20 offers a variety of surf and turf, like lobster, scallops and steak. A creation of restaurateur and chef Peter X. Kelly, whose Hudson Valley restaurants reign in suburbia, this restaurant really stands out for its location and architectural beauty as well as being super convenient to the commuter ferry dock. 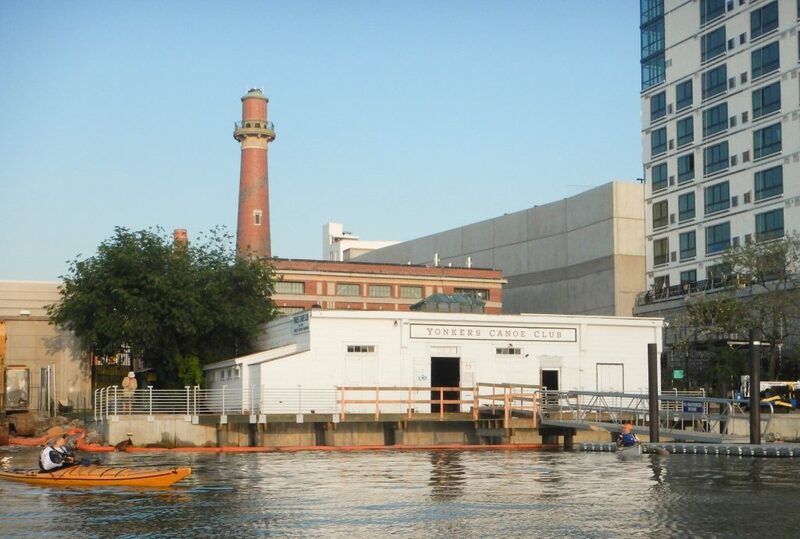 The Yonkers Paddling and Rowing Club, Inc. is a not-for-profit that rents equipment, leads tours, organizes event and educates. Their mission is to “encourage the growth of, and participation in, rowing and paddling sports.” In doing so, they educate and inform the public about the Hudson River’s present and future. 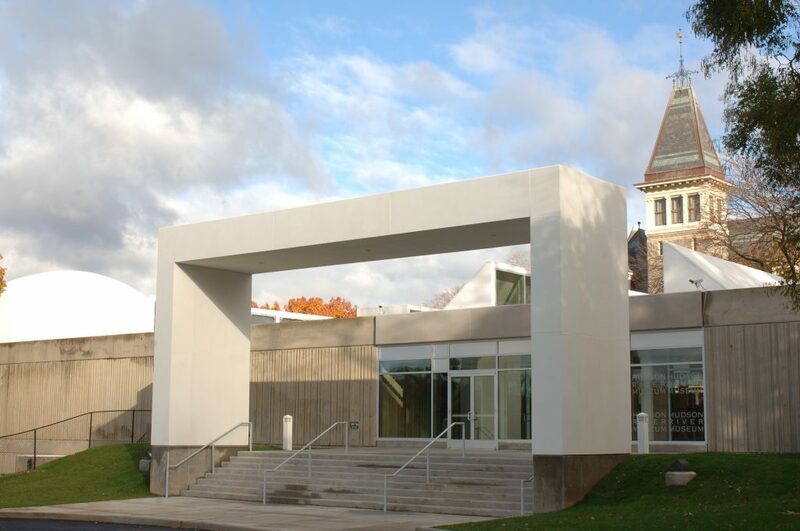 The Hudson River Museum is a multi-disciplinary cultural complex which also has a planetarium. The museum hosts exhibitions, teaching initiatives, research, collecting, preservation and conservation. Their goal is “to enhance people’s understanding of the art, history and science of our region. We support our communities and provide a museum window on the world at large. We serve our visitors well, so that they develop a sense of pride, allegiance and ownership— this is my Museum.” One current exhibit is “riverthatflowsbothways,” which is a four-channel video installation by artist Ellen Kozak and composer Scott D. Miller. Kozak and Miller’s unique collaboration blends three video channels with a single audio channel using non-synchronous loops that present viewers with ever-changing compositional combinations. Billed as “Manhattan’s closest casino,” the Empire City Casino started as the Yonkers Raceway in 1899, originally called the Empire City Trotting Club. Seabiscuit was one of the many famous thoroughbreds that graced this track. In 1972, the Rooney Family acquired the Yonkers Raceway in 1972 and has maintained live harness racing for over 35 years. The casino boasts over 5,000 of the “hottest machines” available and the half-mile harness race track allows betting in person and online. Empire City Casino employs a significant number of women in executive and leadership roles throughout many departments on their 100-acre facility. And there are a ton of dining options will satisfy even the most discerning palate with Italian cuisine at Nonno’s Trattoria; Dan Rooney’s, a high-energy sports bar; Alley 810, a craft cocktail lounge with retro bowling lanes; and convenient delicious options at the International Food Court or Lil’ Cocina. Docked in downtown Yonkers just north of the Yonkers Pier, the Science Barge is a prototype sustainable urban farm developed by NY Sun Works and acquired by Groundwork Hudson Valley. Winner of the Omega Institute’s Leadership in Sustainable Education Award in 2014, Groundwork uses its place-based approach to promote science, technology, engineering, and math skills, also known as STEM education. Through experiential classrooms, they make STEM concepts tangible and relevant to thousands of students each year. 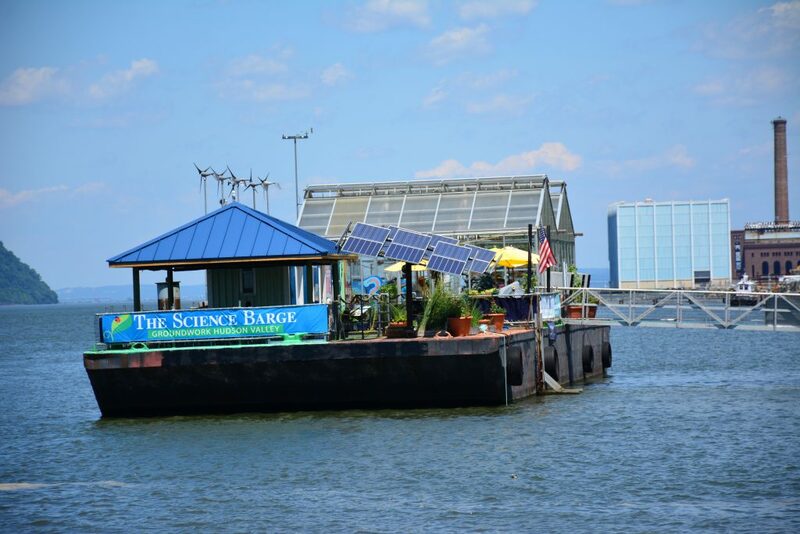 The Science Barge is an off-the-grid education center/greenhouse, floating on the Hudson River. It grows fresh produce with zero net carbon emissions, zero pesticides, and zero runoff. All of the energy needed to power the Barge is generated by solar panels, wind turbines, and biofuels while the hydroponic greenhouse is irrigated solely by collected rainwater and purified river water, thus operating completely “off the grid.” It is the only fully functioning demonstration of renewable energy supporting sustainable food production in New York. 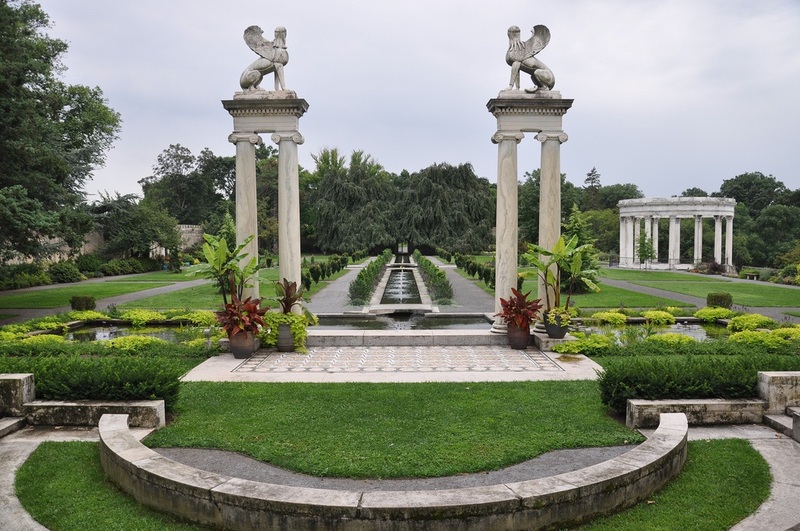 Yonkers is also home to the Untermyer Gardens, a 43-acre park considered to be one of the finest Persian gardens in the Western Hemisphere. Notable features include an amphitheater, a pavilion, the “Temple of Love,” and a “Vista” staircase. During its season that begins in April and ends at the end of October, the stunning garden offers events, including live dance, theatre and music events. 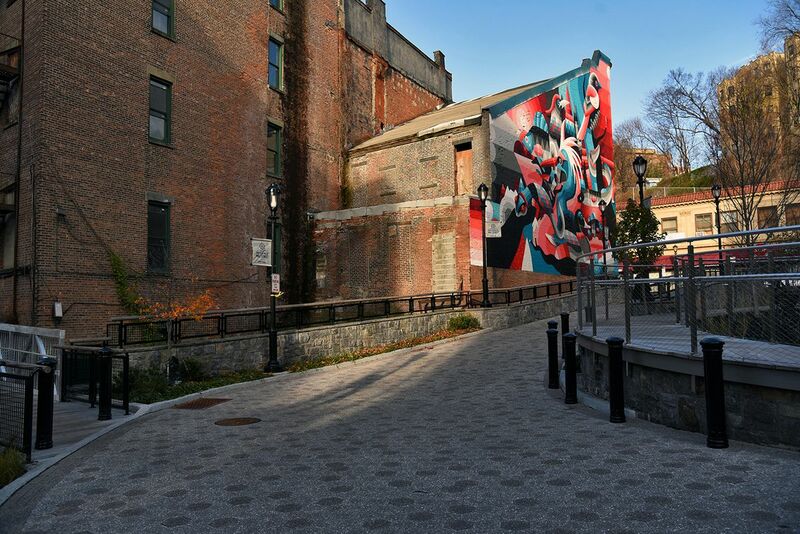 It is not often that Yonkers can claim to be more innovative than New York City, but in its gritty downtown corridor, a unique project unlike anything in the five boroughs is currently unfolding. 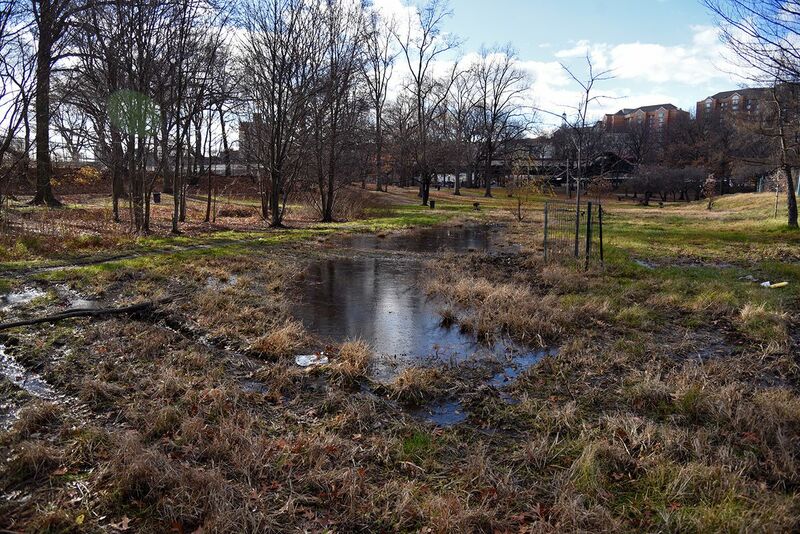 Millions of dollars have been invested, dozens of buildings have been demolished, parking lots have been ripped up and removed from the center of town, and new habitats for muskrats, egrets, and American eels have been created. 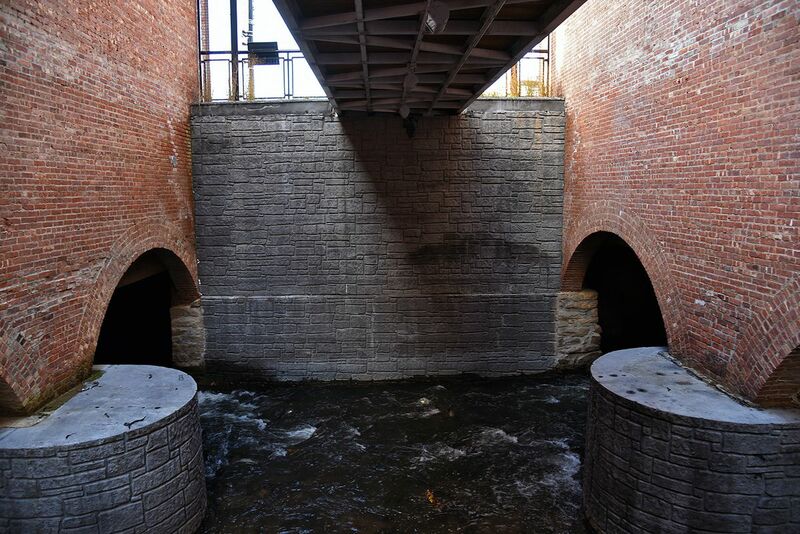 This is the daylighting of the Saw Mill River, one of the most daring river restoration projects on the East Coast. 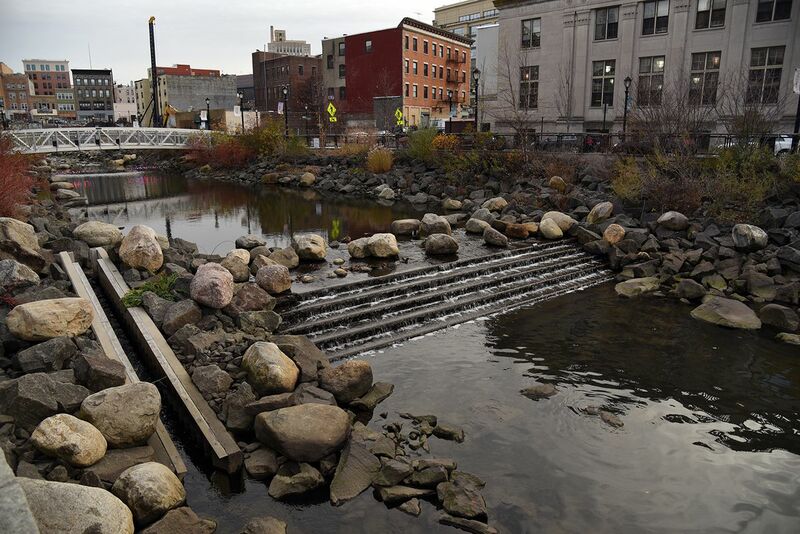 As the last vestiges of the urban industrial waterfront are slowly erased from New York state’s post-industrial cities, many of its polluted rivers and waterways are finally being remediated and modernized, and in New York City, this has led to an impressive array of restoration projects. 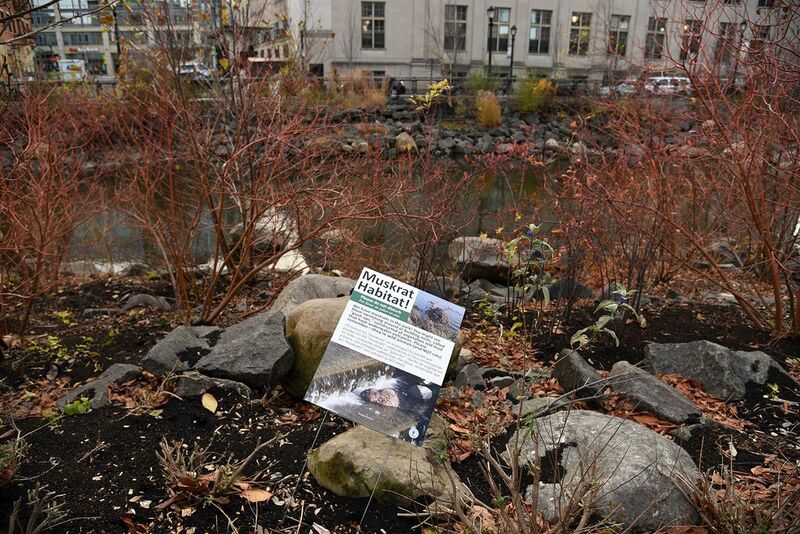 Wetlands are being replanted at Alley Creek, reforestation work is being completed along the Bronx River, Superfund cleanups have begun in the Newtown Creek and Gowanus Canal, marshes and parks are being created along the Harlem River, and new creeks are now being engineered in the Staten Island Bluebelt system. But the city has yet to daylight any of its buried rivers. 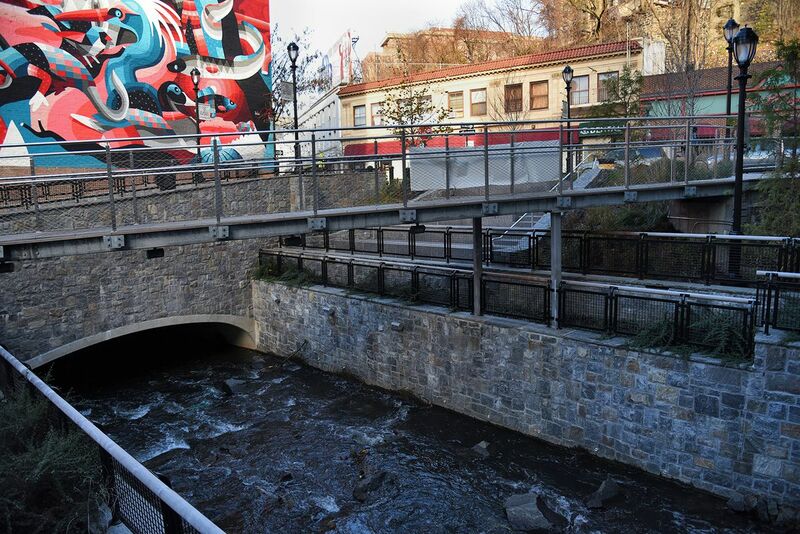 This past summer, the latest phase of daylighting along the Saw Mill River was completed at the Mill Street Courtyard, an $8.3 million restoration project that has created a series of elevated walkways and small public plazas above the river, inside a city block that was once a weed-strewn empty lot. The project will soon expand into a fourth phase upriver, and this past week the city received a $2.5 million grant, which will help daylight a segment of the waterway buried underneath a desolate sea of concrete called Chicken Island. New York City is definitely not Yonkers, and we probably won’t be tearing down buildings in Midtown anytime soon to unearth hidden rivers and create fish ladders. 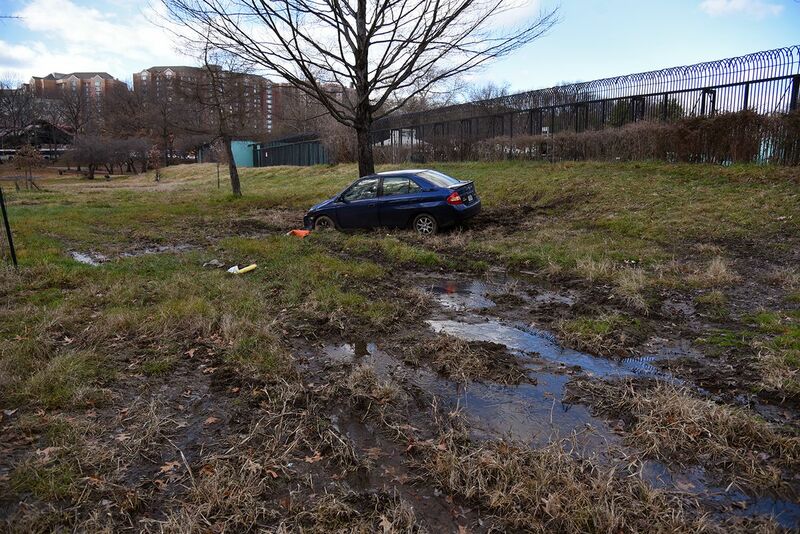 But the city does have several extensive buried waterways that could be brought back to the surface. 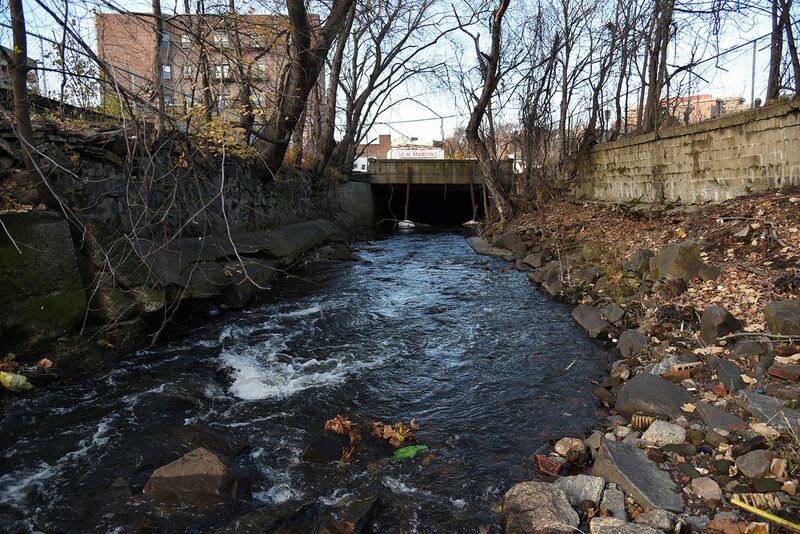 The chief candidate among them is the lower section of Tibbetts Brook, which travels underground beneath the streets of the Bronx after flowing aboveground through Yonkers, just a mile away from the Saw Mill River. Although daylighting New York City’s underground rivers could help reduce the massive amounts of rain and freshwater that currently flow into the sewage system, finding a way to separate out household waste from underground creeks is something that has so far been prohibitively expensive. “It’s hard to daylight. It’s very expensive to daylight,” says Bacle. “It’s difficult in a big city, because a lot of the sewers are combined. I think the key is thinking organically about all these different elements, and that’s what makes the best projects. 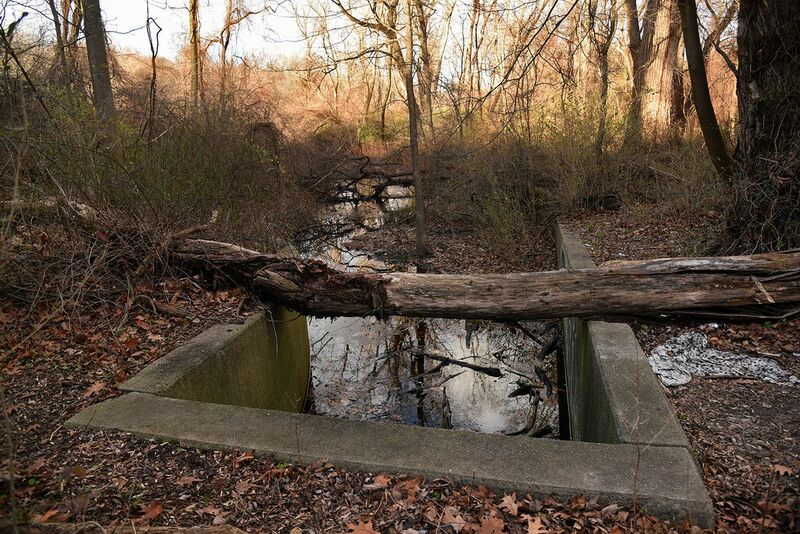 But it’s all a question of money as well.” For now, a walk up the Saw Mill River and down Tibbetts Brook offers up a fascinating chance to consider the future possibilities for New York’s historic rivers. The industrial history of the Saw Mill River dates back to Adriaen van der Donck, a famed Dutch colonist, who built the first mill in the area at this site in the 1650s. The river still flows past Philipse Manor Hall, the former residence of a mill owner that dates back to 1682. 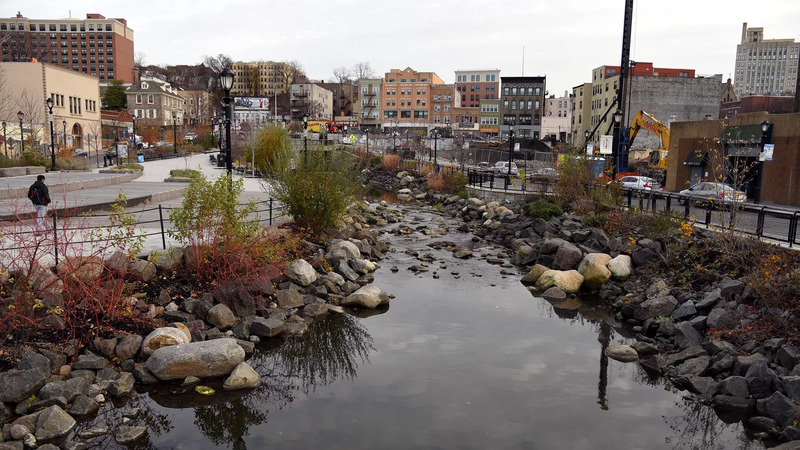 Today, this new section of the Saw Mill River flows through a public park with an outdoor classroom and stage, before passing underneath the Yonkers train station and emptying out into the Hudson River. 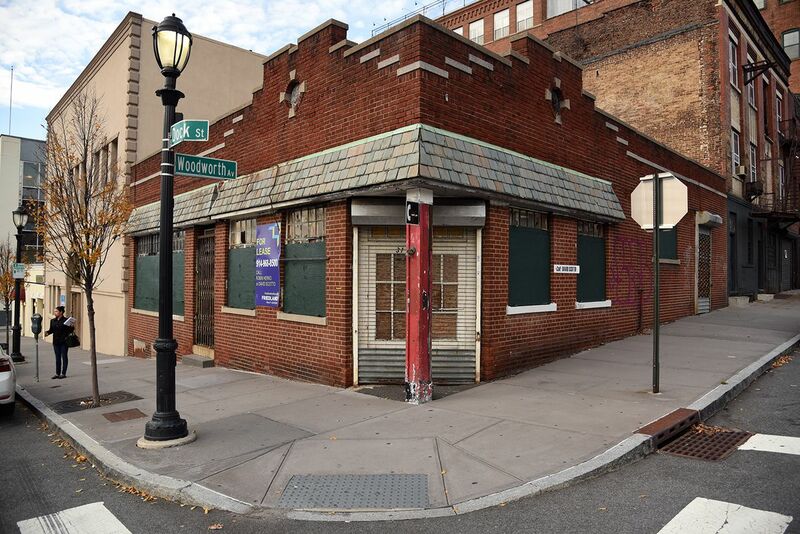 Despite the city’s hopes that the daylighting project would rejuvenate the area, many of the older storefronts in downtown Yonkers remain vacant and boarded up. “It was a big manufacturing city, and now what is it? What fills the void? How do you bring people back, and reinvent it as a space where people want to live?” says Bacle. 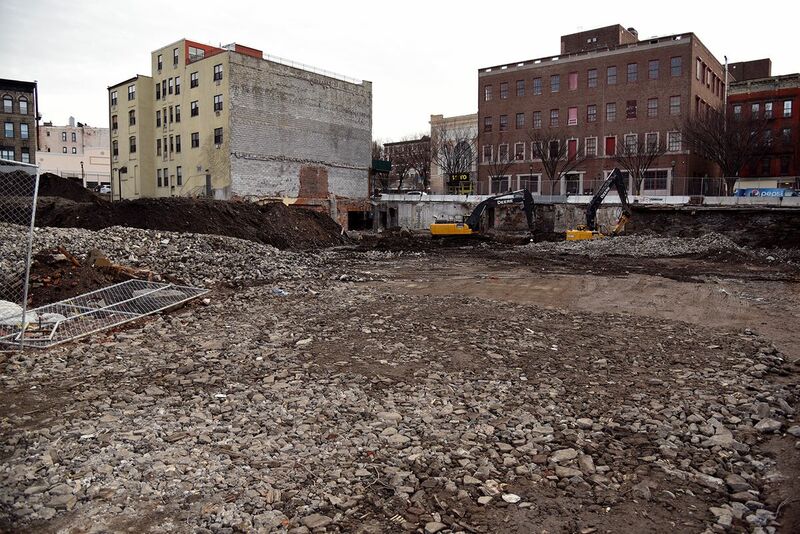 A large section of historic buildings along the southern bank of the river is now being demolished, to make way for a 442-unit housing complex. “The project includes two 25- and 17-foot towers plus a 539-space parking garage,” according to the Journal News. 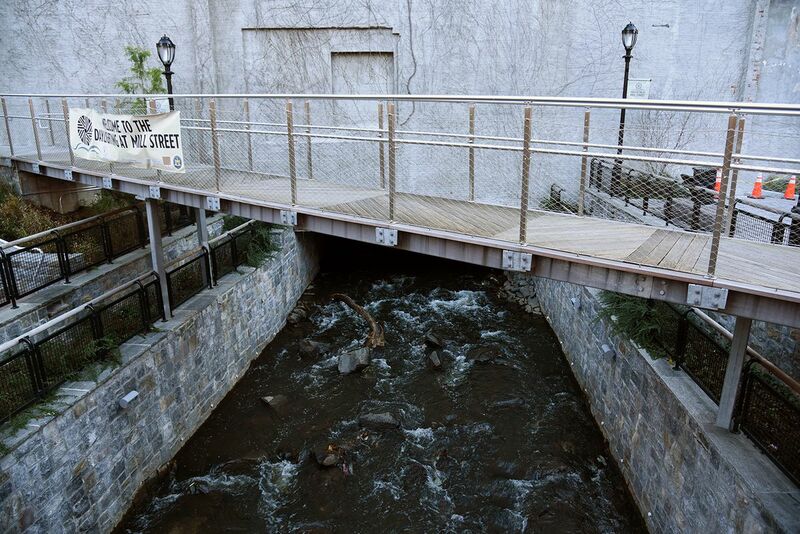 Upstream, at the Mill Creek Courtyard, phase three of the Saw Mill River daylighting has now been completed, opening up the interior of a downtown block. 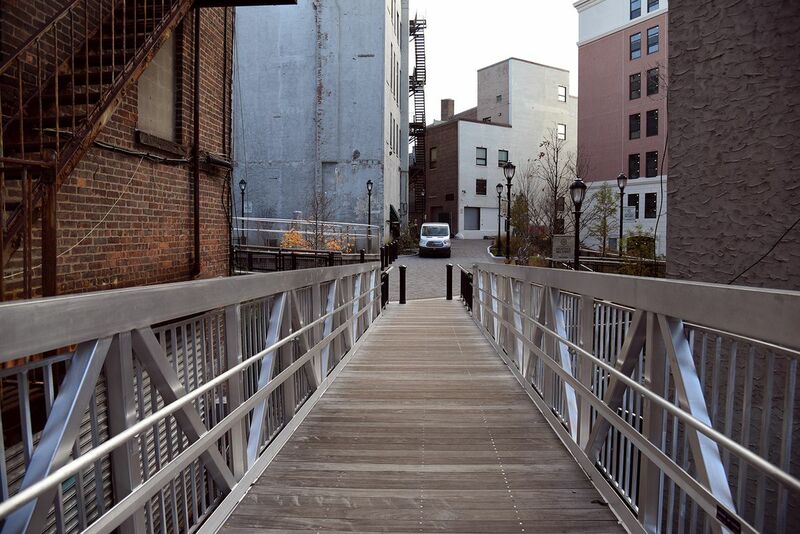 An elevated walkway brings visitors into a mid-block courtyard, while passing above the previously hidden river. Under the walkway, the river flows underneath two older warehouses, and past a small subterranean plaza planted with trees and shrubs. 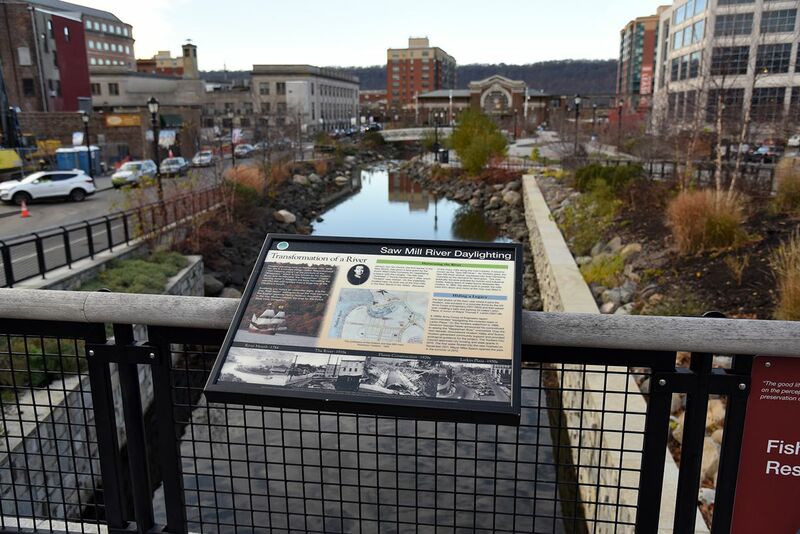 Further into the new park, the river travels underneath a second walkway, where the sound of flowing water blocks out the nearby traffic of downtown Yonkers. The project here is modeled on “a type of vehicular-pedestrian street found in the Netherlands called a woonerf,” according to the Journal News. A small amphitheater and a large mural have been completed here, providing a quiet respite in the center of town. With three entry points, the central plaza of the Mill Creek Courtyard is now a busy interchange for pedestrians, joggers, and delivery trucks. Again, though, boarded up and empty buildings are a constant presence at the edge of the river. Further up the river, Phase Two of daylighting helped create a park and overlook along this short segment, where a strip of buildings was demolished on the opposite banks to open up views of the river. 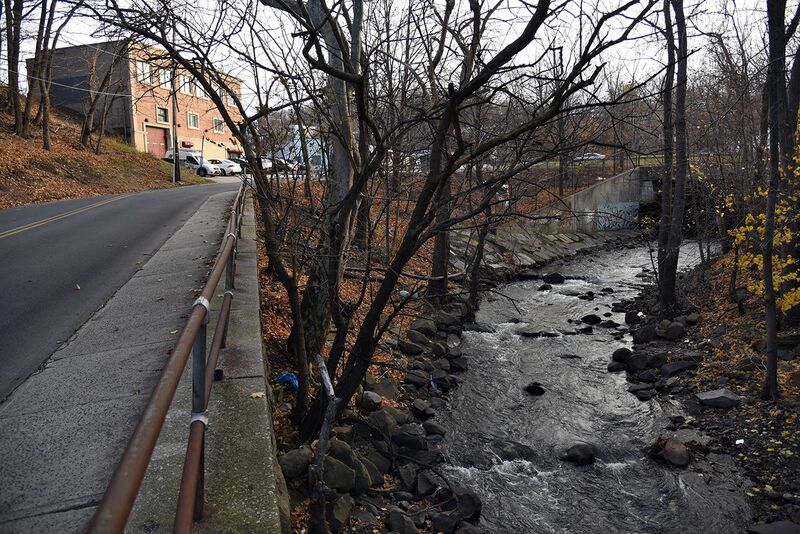 This is one of the few places in Yonkers where the waters of the Saw Mill River are easily accessible. From here, they flow underground, and then into Phase Three and Phase One, where the water is largely blocked off by railings and walls. Upstream, the river goes underground once again, beneath the parking lot of Chicken Island. Phase Four of the daylighting process is scheduled to bring the river back into view here. 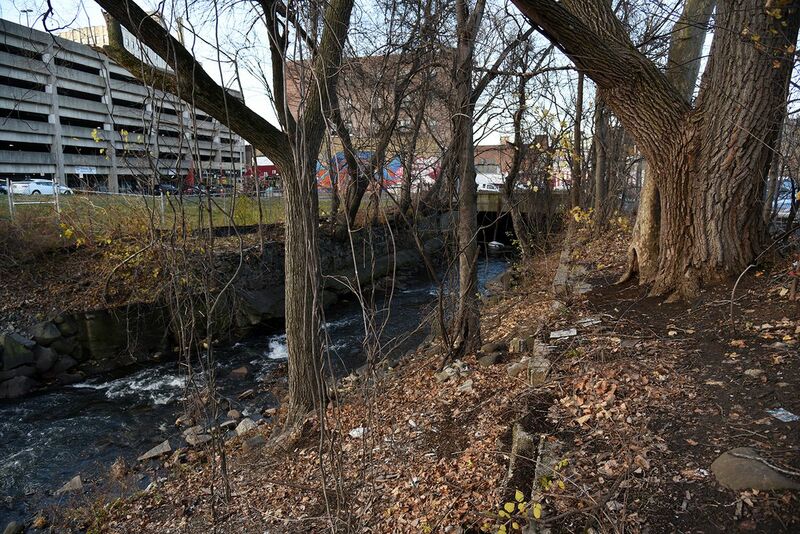 The river emerges once again beyond Chicken Island, flowing uncovered through much of Yonkers, although its waters are largely inaccessible and impassable, hidden behind warehouses and fences and blocked off by rocks and fallen trees. 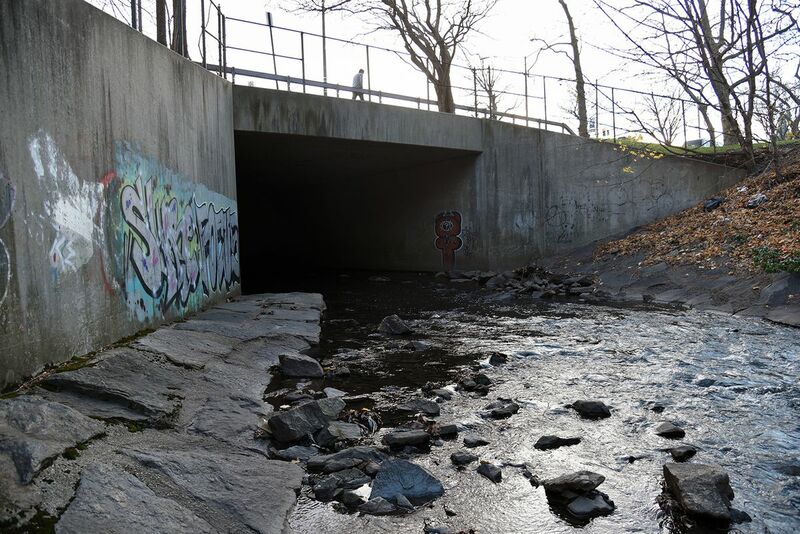 Near Walsh Road and Nepperhan Avenue, the river flows through a graffiti-covered underpass, one of the only other areas where the water is easily accessed. Nepperhan was the original Native American name for the Saw Mill River. From here, the Saw Mill River continues upstream for another 20 miles, running for much of its length alongside the Saw Mill River Parkway. Just a mile from here is Tibbetts Brook Park, where the waters of Tibbetts Brook flow downstream from a manmade pond. 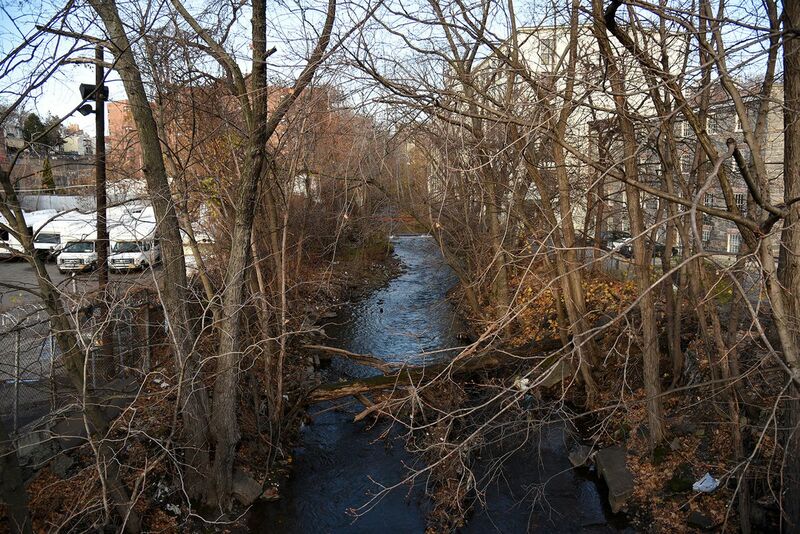 Tibbetts Brook also flows next to the Saw Mill River Parkway in Yonkers, before entering the Bronx. From the constant traffic above, few drivers can see down into the sunken waterway. 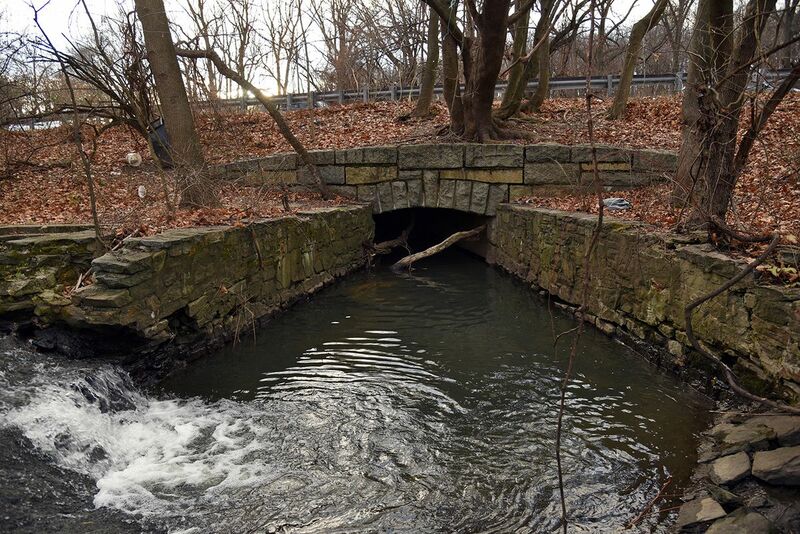 The brook flows south into the overgrown wetlands of Van Cortlandt Park, where it crosses under the Henry Hudson Parkway. 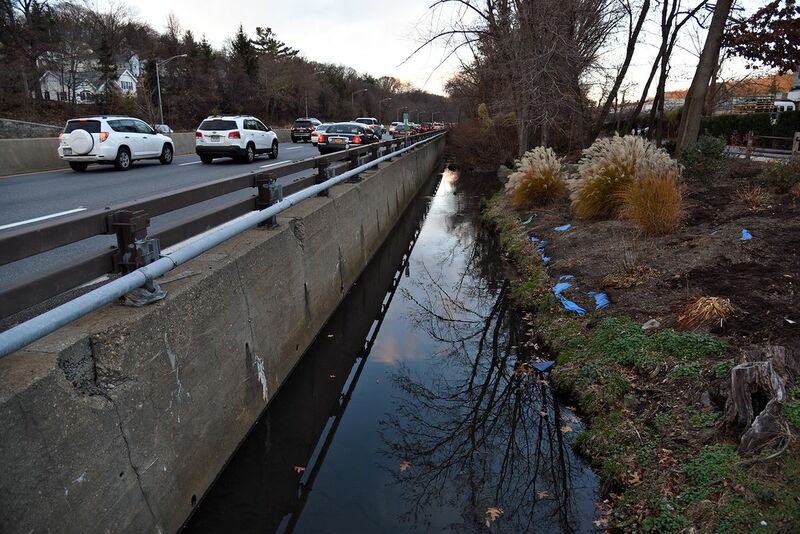 Tibbetts Brook was once called Moshulu by the Lenape Native Americans, a name now given to yet another parkway. In Van Cortlandt Park, branches of Tibbetts Brook are rerouted around a public golf course and travel underneath various overpasses. This waterway helps drain a watershed of approximately 850 acres. This shallow branch of the brook is a barrier to keep the public away from the golf course’s fairway. The river and golf course are also blocked off by a series of chain link fences. 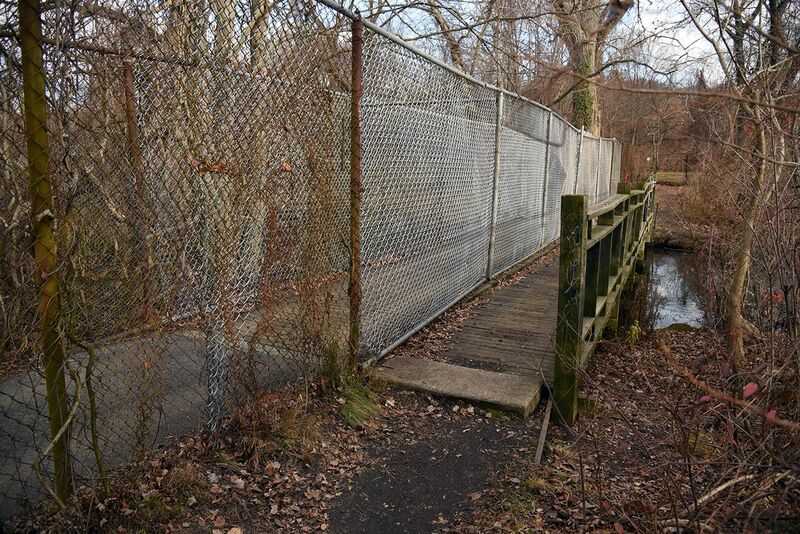 Access to the brook throughout the park has been closed off by the golf course, which has even cut bridges in half, to give better access to golf carts. 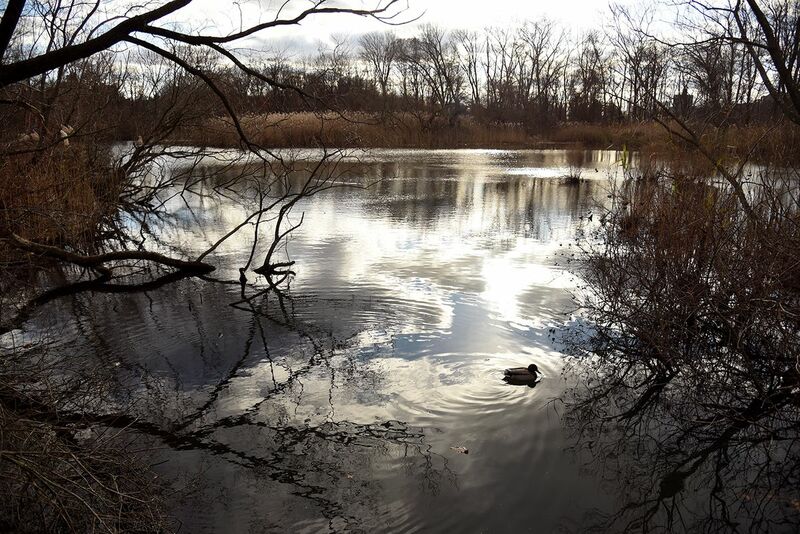 The brook continues its manmade route down into Van Cortlandt Lake, and is home to a wide variety of animals, include coyotes, herons, owls, woodpeckers, rabbits, raccoons, muskrats, and skunks, according to the Parks Department. 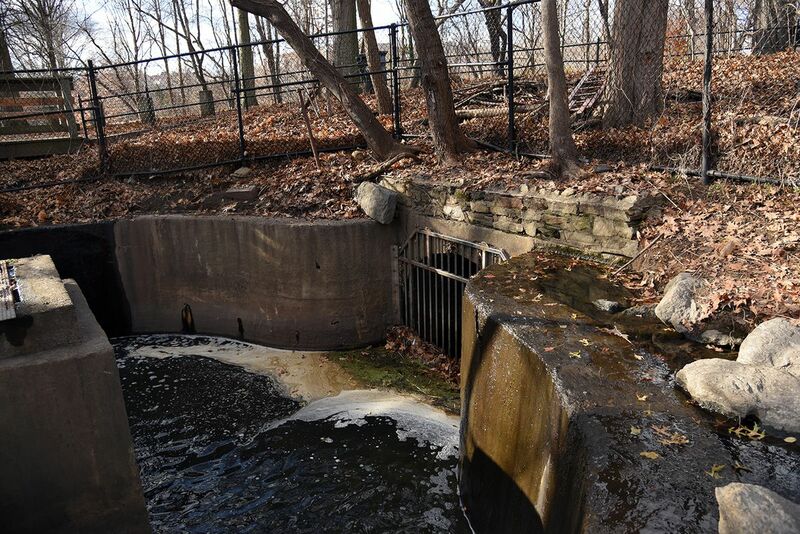 At the end of the lake, Tibbetts Brook is routed underground, and into the sewer system. “That’s a case where you can say this water is not part of the city’s wastewater system up until this point, and daylighting would keep it from ever being part of that system,” says Steve Duncan. 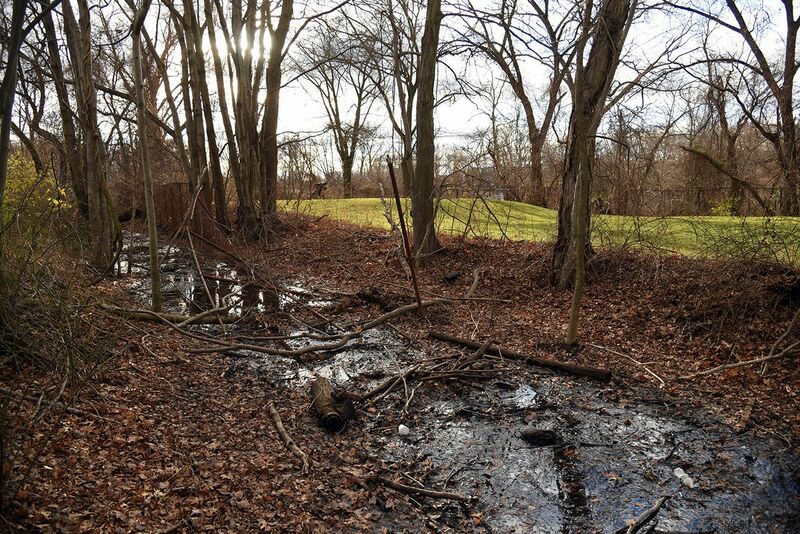 Despite every effort to control its flow, a final section of water floods out from a marshland in Van Cortlandt Park, covering pathways and a barbecue area. From here, Duncan envisions the stream running down the center of Broadway and out to the Harlem River. Nathan Kensinger is a photographer, filmmaker, and curator who has been documenting New York City’s abandoned edges, endangered neighborhoods, and post-industrial waterfront for more than a decade. His Camera Obscura photo essays have appeared on Curbed since 2012. “Industrial Twilight,” an exhibit of Kensinger’s photographs of Brooklyn’s changing waterfront, is currently being exhibited at the Atlantic Avenue subway station in Brooklyn. Yonkers Mayor Mike Spano, along with other local elected officials, will pay tribute to former Yonkers Mayor Angelo R. Martinelli with the unveiling of a bronze plaque dedicated to him at Metro-North’s Yonkers Train Station, Friday, June 29 at 1PM in the train station’s Main Lobby. In the late 1980s, Mayor Martinelli played a pivotal role in the renovation of the Yonkers train station and in the designation of Yonkers as an Amtrak stop, establishing Yonkers as the gateway to the Hudson Valley. YONKERS, NY – June 20, 2018 – Yonkers Mayor Mike Spano today announced the City of Yonkers will celebrate Yonkers Parks Day in honor of National Parks and Recreation Month on Saturday, July 14th from 2 PM to 6 PM, at four of Yonkers’ City parks. Each of the four park locations will include arts and crafts, music, refreshments, sports including; badminton, volleyball, relay races, along with so much more, FREE of cost for all Yonkers residents. For further information regarding the day’s festivities, contact the City of Yonkers Parks, Recreation & Conservation Department offices at 914-377-6450. YONKERS, NY – June 18, 2018 – Mayor Mike Spano announced today the City of Yonkers will designate several locations throughout the city as Cooling Centers as temperatures will reach 95+ degrees, combined with high levels of humidity. Yonkers, NY – June 13, 2018 — Following weeks of budget hearings and public advocacy meetings, the City of Yonkers 2018-2019 Budget tonight was adopted with a 7-0 vote by the Yonkers City Council. The amended Adopted Budget submitted by Mayor Mike Spano includes $8.8 million in additional state aid, increased funding to the Yonkers School District and contains no cuts in services or layoffs and eliminates most vacant positions. “After numerous discussions with our State leaders about the financial needs of our city, I was able to submit an amended budget to our City Council that contains additional funding to our schools and avoids layoffs. 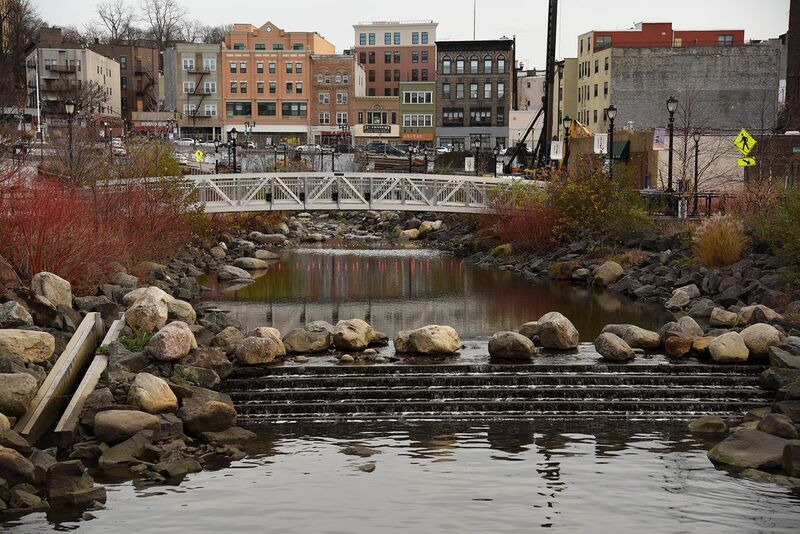 I thank Governor Andrew Cuomo and his staff for recognizing the discrepancies in funding to Yonkers and their help in restoring positions and services vital to our residents,” said Mayor Spano. The City of Yonkers is increasing the Board of Education’s (BOE) operating budget to $582.6 million. On the municipal side, the Adopted 2018-2019 Budget maintains all departments and funds vital services. Tonight’s vote includes an increase in the property tax levy of 6.2%. A typical one-to-three family home at the median assessed value of $11,200 would see their annual property tax bill increase by approximately $560, or $46 per month. The Municipal Operating Budget also includes a $5 million appropriation of specialized aid by the New York State Financial Restructuring Board for Local Governments. 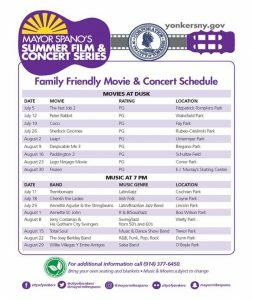 YONKERS, NY – June 7, 2018 – Mayor Mike Spano today announced the schedule for the City’s 2018 Summer Film & Concert Series that will run during July and August at several Yonkers parks. The family-friendly series is FREE of charge and open to children of all ages. Music begins promptly at 7PM on Wednesday nights throughout the summer and the genres range from Jazz to Salsa, Rock, Swing, R & B and much more. Movies will be screened on Thursday evenings in July and August and begin at dusk at various locations throughout the City. All movies are family-friendly and rated PG. Music and movie performances are subject to change and City residents are strongly encouraged to bring their own seating. In case of rain, residents should call the City of Yonkers Department of Parks, Recreation & Conservation at 914-377-6450 or visit @CityofYonkers on Facebook and Twitter to confirm cancellations.